The intent of this article is not to tell you everything you wanted to know about artificial neural networks (ANN) and were afraid to ask. For that you’ll have to ask someone else. Here I only intend to tell you how you might use R to implement an ANN model. One thing I will say is that I rarely use an ANN. I have found them to work best in an ensemble model (using averaging) with logistics regression models. neuralnet depends on two other packages: grid and MASS (Venables and Ripley, 2002). It is used is primarily with functions dealing with regression analyses like linear models (lm) and general linear models (glm). 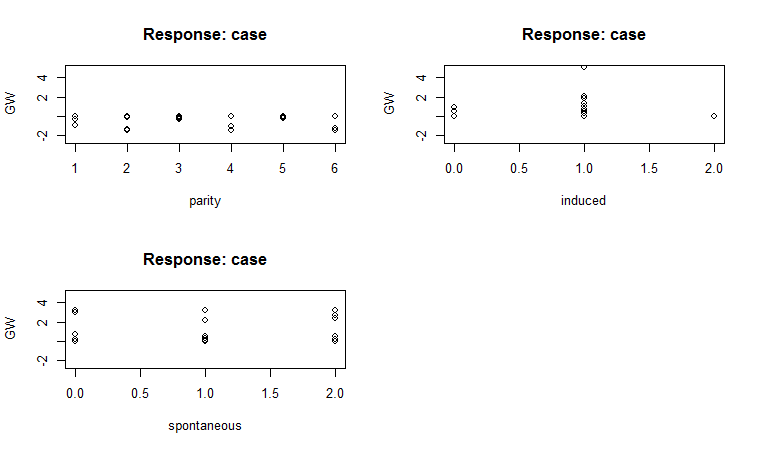 As essential arguments, we must specify a formula in terms of response variables ~ sum of covariates and a data set containing covariates and response variables. Default values are defined for all other parameters (see next subsection). We use the data set infert that is provided by the package datasets to illustrate its application. This data set contains data of a case-control study that investigated infertility after spontaneous and induced abortion (Trichopoulos et al., 1976). The data set consists of 248 observations, 83 women, who were infertile (cases), and 165 women, who were not infertile (controls). It includes amongst others the variables age, parity, induced, and spontaneous. The variables induced and spontaneous denote the number of prior induced and spontaneous abortions, respectively. Both variables take possible values 0, 1, and 2 relating to 0, 1, and 2 or more prior abortions. The age in years is given by the variable age and the number of births by parity. formula, a symbolic description of the model to be fitted (see above). No default. data, a data frame containing the variables specified in formula. No default. net.result, a list containing the overall result, i.e. the output, of the neural network for each replication. weights, a list containing the fitted weights of the neural network for each replication. generalized.weights, a list containing the generalized weights of the neural network for each replication. result.matrix, a matrix containing the error, reached threshold, needed steps, AIC and BIC (computed if likelihood=TRUE) and estimated weights for each replication. Each column represents one replication. startweights, a list containing the starting weights for each replication. The training process needed 5254 steps until all absolute partial derivatives of the error function were smaller than 0.01 (the default threshold). The estimated weights range from −5.14 to 5.59. For instance, the intercepts of the first hidden layer are 5.59 and 1.06 and the four weights leading to the first hidden neuron are estimated as −0.12, 1.77, −2.20, and −3.37 for the covariates age, parity, induced and spontaneous, respectively. If the error function is equal to the negative log-likelihood function, the error refers to the likelihood as is used for example to calculate Akaike’s Information Criterion (AIC). In this case, the object nn$net.result is a list consisting of only one element relating to one calculated replication. If more than one replication were calculated, we would save the each of the outputs in a separate list element. This approach is the same for all values that change with replication apart from net.result that is saved as matrix with one column for each replication. To compare the results, neural networks are trained with the same parameter setting as above using neuralnet with algorithm=”backprop” and the package nnet. nn.bp and nn.nnet show equal results. Both training processes last only a very few iteration steps and the error is approximately 158. Thus, in this little comparison, the model fit is less satisfying than that achieved by resilient backpropagation. The columns refer to the four covariates age (j =1), parity (j = 2), induced (j = 3), and spontaneous(j = 4) and a generalized weight is given for each observation even though they are equal for each covariate combination. The resulting plot is given in Figure 1. Figure 1: Plot of a trained neural network including trained synaptic weights and basic information about the training process. It reflects the structure of the trained neural network, i.e. the network topology. The plot includes by default the trained synaptic weights, all intercepts as well as basic information about the training process like the overall error and the number of steps needed to converge. Especially for larger neural networks, the size of the plot and that of each neuron can be determined using the parameters dimension and radius, respectively. The corresponding plot is shown in Figure 2. Figure 2: Plots of generalized weights with respect to each covariate. The generalized weights are given for all covariates within the same range. The distribution of the generalized weights suggests that the covariate age has no effect on the case-control status since all generalized weights are nearly zero and that at least the two covariates induced and spontaneous have a non-linear effect since the variance of their generalized weights is overall greater than one. compute calculates and summarizes the output of each neuron, i.e. all neurons in the input, hidden and output layer. 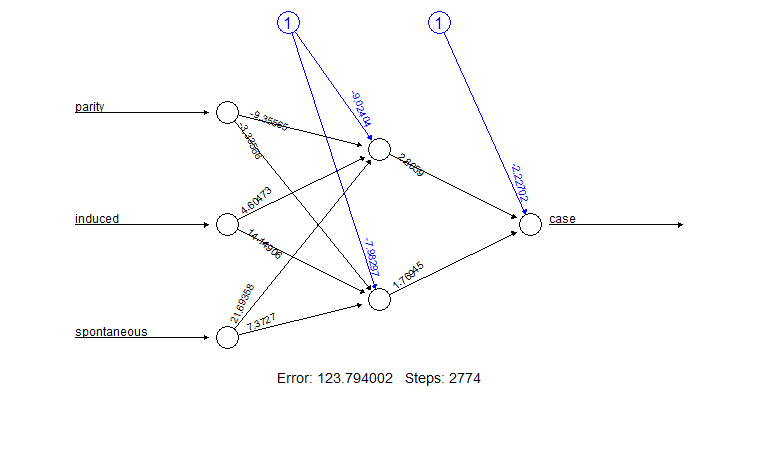 Thus, it can be used to trace all signals passing the neural network for given covariate combinations. 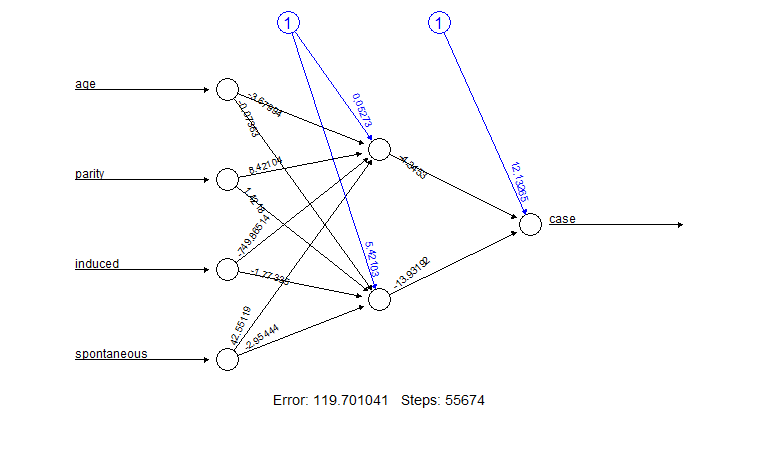 This helps to interpret the network topology of a trained neural network. It can also easily be used to calculate predictions for new covariate combinations. A neural network is trained with a training data set consisting of known input-output pairs. It learns an approximation of the relationship between inputs and outputs and can then be used to predict outputs o(xnew ) relating to new covariate combinations xnew . The function compute simplifies this calculation. It automatically redefines the structure of the given neural network and calculates the output for arbitrary covariate combinations. This means that the predicted probability of being a case given the mentioned covariate combinations, i.e. o(x), is increasing in this example with the number of prior abortions. The weights of a neural network follow a multivariate normal distribution if the network is identified (White, 1989). A neural network is identified if it does not include irrelevant neurons, neither in the input layer nor in the hidden layers. An irrelevant neuron in the input layer can be, for instance, a covariate that has no effect or that is a linear combination of other included covariates. If this restriction is fulfilled and if the error function equals the negative log-likelihood, a confidence interval can be calculated for each weight. The neuralnet package provides a function to calculate these confidence intervals regardless of whether all restrictions are fulfilled. Therefore, we have to be careful interpreting the results. Figure 3: Plot of the new trained neural network including trained synaptic weights and basic information about the training process. For each weight, ci$lower.ci provides the related lower confidence limit and ci$upper.ci the related upper confidence limit. The first matrix contains the limits of the weights leading to the hidden neurons. The columns refer to the two hidden neurons. The other three values are the limits of the weights leading to the output neuron. This paper gave a brief introduction to multilayer perceptrons and supervised learning algorithms. It introduced the package neuralnet that can be applied when modeling functional relationships between covariates and response variables. neuralnet contains a very flexible function that trains multilayer perceptrons to a given data set in the context of regression analyses. It is a very flexible package since most parameters can be easily adapted. For example, the activation function and the error function can be arbitrarily chosen and can be defined by the usual definition of functions in R.
Akaike. Information theory and an extension of the maximum likelihood principle. In Petrov BN and Csaki BF, editors, Second international symposium on information theory, pages 267–281. Academiai Kiado, Budapest, 1973. Almeida, C. Baugh, C. Lacey, C. Frenk, G. Granato, L. Silva, and A. Bressan. Modeling the dsty universe i: Introducing the artificial neural network and first applications to luminosity and color distributions. Monthly Notices of the Royal Astronomical Society, 402:544–564, 2010. Anastasiadis, G. Magoulas, and M. Vrahatis. New globally convergent training scheme based on the resilient propagation algorithm. Neurocomputing, 64:253–270, 2005. Bishop. Neural networks for pattern recognition. Oxford University Press, New York, 1995. Fritsch and F. Günther. neuralnet: Training of Neural Networks. R Foundation for Statistical Computing, 2008. R package version 1.2. Günther, N. Wawro, and K. Bammann. Neural networks for modeling gene-gene interactions in association studies. BMC Genetics, 10:87, 2009. http://www.biomedcentral.com/1471-2156/10/87. Hornik, M. Stichcombe, and H. White. Multilayer feedforward networks are universal approximators. Neural Networks, 2:359–366, 1989. Intrator and N. Intrator. Interpreting neural-network results: a simulation study. Computational Statistics & Data Analysis, 37:373–393, 2001. Kumar and D. Zhang. Personal recognition using hand shape and texture. IEEE Transactions on Image Processing, 15:2454–2461, 2006. C. Limas, E. P. V. G. Joaquín B. Ordieres Meré, F. J. M. de Pisón Ascacibar, A. V. P. Espinoza, and F. A. Elías. AMORE: A MORE Flexible Neural Network Package, 2007. URL http://wiki.r-project. org/rwiki/doku.php?id=packages:cran:amore. R package version 0.2-11. McCullagh and J. Nelder. Generalized Linear Models. Chapman and Hall, London, 1983. Riedmiller. Advanced supervised learning in multilayer perceptrons – from backpropagation to adaptive learning algorithms. International Journal of Computer Standards and Interfaces, 16:265–278,1994. Riedmiller and H. Braun. A direct method for faster backpropagation learning: the rprop algorithm. Proceedings of the IEEE International Conference on Neural Networks (ICNN), 1:586–591, 1993. Rocha, P. Cortez, and J. Neves. Evolutionary neu- ral network learning. Lecture Notes in Computer Science, 2902:24–28, 2003. Rojas. Neural Networks. Springer-Verlag, Berlin, 1996. Schiffmann, M. Joost, and R. Werner. Optimization of the backpropagation algorithm for training multilayer perceptrons. Technical report, University of Koblenz, Insitute of Physics, 1994. Schwarz. Estimating the dimension of a model. Ann Stat, 6:461–464, 1978. Trichopoulos, N. Handanos, J. Danezis, A. Kalandidi, and V. Kalapothaki. Induced abortion and secondary infertility. British Journal of Obstetrics and Gynaecology, 83:645–650, 1976. Venables and B. Ripley. Modern Applied Statistics with S. Springer, New York, fourth edition, 2002. URL http://www.stats.ox.ac.uk/ pub/MASS4. ISBN 0-387-95457-0. White. Learning in artificial neural networks: a statistical perspective. Neural Computation, 1:425–464, 1989. Rare because I couldn’t find many R neural network references. Even though I finished Andrew Ng’s course and have been aware of many other NN resources the bibliography in this article is daunting. Can the author simplify the steps required to gain NN expertise ? I am a IT programmer. I do not think I can simplify them more using R. However, there are other tools (commercial) with GUI that makes it simpler for a non programmer. Other may know of additional open-source tools. I’m searching for a package in R which implement NARX networks for realtime forecasting, and I would appreciate if someone can bring me some information or bibliografy about it. before jumping into Ecig comparison, one should know what ane-cigarette is and how it works. An actual, scientific comparison was not the intent. The data is a from an R dataset that I didn’t have to go out and buy, which is what one world have to do for a real comparison, plus what you rightly suggest in understanding the underlying data. One of the cons of using a neural network is that the algorithm doesn’t care about the underlying data and will learn from it, whether it is right or wrong. I have always argued that analysts must not only understand the underling data, but also the underlying phenomenon. Be that as it may, this was merely a tutorial on using R and nothing more. Hi really helpful. I am just wondering about interpretation of the Neural network. How could one best summarize the results.